For the past several weeks I have been reading through the book of Romans. Through reading it, rereading it, and copying down passages I have been learning one main thing: I see so clearly that I am loved so much that the God of the universe made a way for me to spend eternity with Him. Through the Law given to Moses in the Old Testament I fall flat on my face. Worse, I am completely dead in my sins (Eph. 2:5). But out of overwhelming compassion, God scooped me up…. bloody, wretched, filthy sinner that I was – dead – and breathed life in me through salvation in Jesus Christ and said, “I choose you.” This makes me weak at the knees. I cannot possibly put into words what it feels like in that moment when it really sinks in how hopeless my situation as a sinner was before God made me His child – His heir (Rom. 8:17). I went from guilty sinner to justified child of God. God personally chose me to be one of His and gave my life meaning and purpose. You want to know what is so incredible? The fact that God made galaxies and oceans, two things that scientists have been studying and mesmerized with for hundreds of years; two things that gloriously show the handiwork of their creator God and boast of His name, but yet He looked at me and said, “I love you more”. That is even more than incredible, it’s indescribably wonderful. I am loved and am chosen by a phenomenal God. This blog post isn’t meant to be long or really thought-provoking. It serves only one purpose: to tell of the goodness of the God I love and live for. I have become overwhelmed so many times lately by God revealing His grace and sovereignty in my life that I physically cannot hold it in any longer. This is simply me sharing with you all how much I know I don’t deserve the love of my heavenly Father, but that I am so grateful that I have been chose by Him and passionately loved by Him and how I know that I have purpose and meaning because of Him. I remember “graduation season” vividly and I often refer to it at my entrance into adulthood (even though I wasn’t officially an adult until three months after graduation when I turned eighteen). That season was a HUGE growing experience in my life mentally, emotionally, and especially spiritually. I had to learn how to face the world’s daunting questions; and to be honest, they almost seem to be used to intimidate “new comers” (high school graduates). All that was expected of me from the world’s standpoint was to do well in school and participate in extracurricular activities… until now, when suddenly I needed to know exactly what I wanted to do with rest of my life. People expect you to have a game plan written out and to do everything possible to reach the end result, whatever that may entail. Let me just be honest with you… I believed that lie for a time. I believed I had to have everything figured out by sophomore/junior year in high school and dedicate my entire life to reach personal success. I had a plan. I was working on achieving it. I wish I had known this years ago – and I mean really known this, because there are some people who will say this, but that doesn’t mean it actually sinks in and you fully grasp the concept – but you don’t have to have everything figured out. In fact, I believe you can’t have everything figured out. For one simple reason. You are not omniscient (all-knowing). None of us are. I don’t know what my future holds, so I have to trust the One Who does. God has also revealed a very important truth to me recently, our lives go through seasons of what we are supposed to do. You might be thinking, “Umm, I already knew that. Tell me something I don’t know.” But you have to understand that I sincerely believe that God calls us to (sometimes very) different things at different seasons in life. Up through half of my senior year in high school I wanted so badly to go off to college. But God had a different plan for me (as I’ve talked about so many times before) and for the first two years after graduation I stayed at home. I worked around the house, volunteered for a couple of different ministries, and taught beginner piano to bring in a little money. I know that God was teaching me how to fully trust in Him (which, for the record, I’m still learning to do faithfully) and His plan for my life. That was an important season in my life that I am incredibly grateful that I had. He doesn’t reveal the whole thing to us. He gives us one chapter at a time – in fact, many times He doesn’t even give us that much. It’s more like one page at a time. These are our seasons. He is using this to build faith and trust in Him. It’s amazing how different one season can look from another, too. That season of “staying home” has come to a close for me; I’ve been working part time for over a year now and as of last month am building up to working full-time (collectively between a few different part-time jobs) and am working towards building my own business. And you know what? I am loving this season (just like the one before this) for one reason: I believe this is where God has me in this season and I am working hard toward goals that the Lord is leading me to pursue during this amazing time in my life. I have found joy in these different times; not that they were always “fun” or that I was always filled with happiness, but I am learning that there’s purpose in it and through it all I pray that I glorify God. I want so badly for you to know that if you don’t have a plan for five years into the future, just be faithful with what God has given you to do this month. Very rarely does life go as you planned. Trust God and work hard on what you have to do RIGHT NOW. Let Him lay the pieces as He sees fit. Also know that this whole trusting thing is going to be a daily choice. Let me say that again, trusting God is a daily choice. It is not a one-time thing. When you’re nervous because the summer is halfway through already and you aren’t sure what you’re going to do in the fall, trust God. When the people around you are pressuring you into making decisions that you’ve already handed over to God, trust Him. He will never fail you. Always, always, always remember that the sole purpose of our existence here on earth as believers in Christ is to bring glory to God. That’s it. That’s all. If He chooses to make you do that through waiting, do it. You’re going to look odd to most people, even some Christians. But learning that you don’t have to have it all planned out can actually be very freeing if you let it and if you surrender completely to the Lord. I would also like to add that if you DO have big aspirations and you feel like you know where the Lord is leading you, hold those plans with unclenched, totally outstretched arms to God. Because the minute you hold on to those plans too tightly, you’ve put those desires over God in your heart. Trust me, I’ve done it more times than I’d be comfortable admitting publically. I’ve tried taking the control from God by planning out my goals and being so bullheaded about them that I felt like I spun out of control. God allows us to get that way and become desperate so that we realize we need to repent and turn back to Him. Chances are you’ve experienced this in the past, or you may even be going through it right now. Always remember that God will pick you back up, help you to dust off, and gently continue to mold you into Christ’s image. Learn from it! This is something that I will never be perfect at, but I am trying to remember that with every area of my life I need to say, “Thy will be done.” Because through learning that God will call me to focus on different things in different seasons has really opened my eyes to how I can trust Him more fully. By trusting in Him I am glorifying Him. 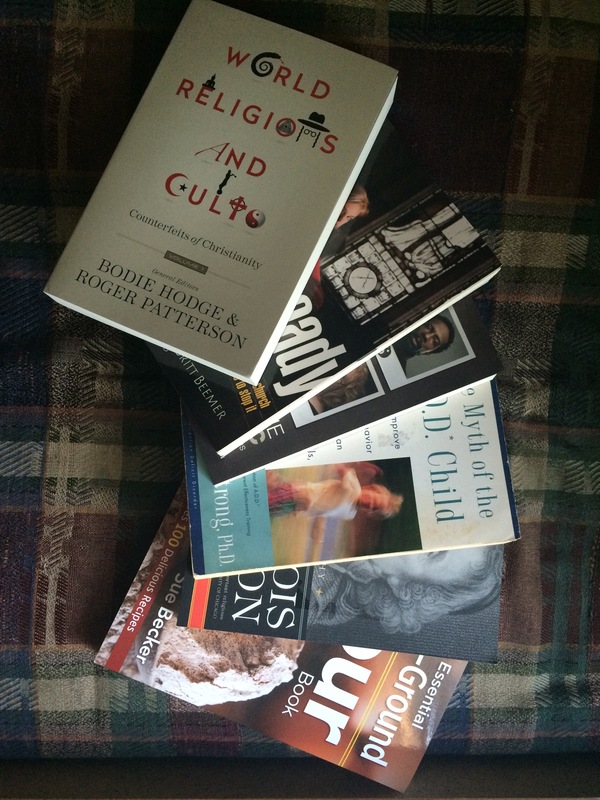 My Summer Reading List – HEAV Convention finds! I am a fan of lists. I am also a fan of reading. So, naturally, I am a huge fan of reading lists! While I was attending Home Educators Association of Virginia’s homeschool convention this month I bought a few (or several…) books that I wanted to make up as my summer reading list for this year! Chances are, I might add books, or edit this list throughout the summer, but for now this is what I have and am so excited to dig into ALL of them! The Essential Home-Ground Flour Book by Sue Becker I’m not going to lie, I dove right into this on the road trip back home from the convention. I was so excited to read it, especially after sitting in on one of the workshops that the author, Sue Becker, hosted that very weekend. I had already become very intrigued by pretty much all things nutrition and whole foods; after this workshop I was inspired to purchase this book and read it. It has two parts to it, the first part is informative and the second is a cook book. So far, I am thoroughly enjoying this book and will be recommending it in the future for anyone who is interested about the benefits of whole wheat and grain. Meet the Skeptic by Bill Foster This is one that I found when roaming through the exhibit hall. I love learning how to effectively defend a biblical worldview, and from reading the back cover, this looked like a good, relatively quick-read on just that. Plus, when I was looking at this book, the lady who was working that booth said that she loved the book! A good recommendation is definitely a good way to get a customer, and it worked on me. Already Gone by Ken Ham & Britt Beemer Ken Ham wrote it, so I already know it is going to be interesting! I had heard of this book before, so when I saw it in the Used Curriculum Sale I snatched it up. This book is all about youth and young adults leaving the church and why. Since I fall in this age group, I want to have a little bit of an understanding on this important topic. The Myth of the A.D.D. Child by Thomas Armstrong, Ph.D. Okay, so you might think this is a very random book to pick up. It might be, but I have been finding things like this intriguing lately. Since it was only $1 in the Used Curriculum Sale I said, “hey, why not?” I’ll give it a try and probably learn something along the way! Francois Fenelon: A Biography by Peter Gorday This is two things I love: history and Christianity. One of my favorite things to do when growing up was reading biographies. I try to do so even now, because there is so much to learn from the lives of those who have lived before me. This was my third find in the Used Curriculum Sale and I am excited to dig into it! World Religions and Cults: Counterfeits of Christianity by Bodie Hodge & Rodger Patterson This book caught my eye as I was roaming the exhibit hall and was actually at the same booth as another book I bought ‘Meet the Skeptic’. After reading the description it immediately captivated me and looks to be along the same lines as ‘Meet the Skeptic’ as far as understanding where other people are coming from and how to witness to them where they’re at. Recently I’ve developed a newfound interest in learning about how people think and facing it with a biblical perspective. Since almost everything a person believes in stems from their religious beliefs, I want to understand a little bit better about that. I am super excited about this book, to say the least – plus it’s the first book in a three part series! So I may be purchasing those in the near future! If anyone is interested in any of the books I have mentioned here, I would love to let you know what I thought of the book once I’ve finished it. Have you personally read any of these books? What are your thoughts? Also, if you attended HEAV’s convention this month, what books/material did you purchase that you’re super excited about diving into? Let me know! I would love to hear from you! I was personally given the opportunity to be involved as a volunteer in a few different areas of the convention throughout the weekend. I have had the privilege of being a volunteer blogger for HEAV for about three years now, and this past weekend was my second year as a convention blogger. Mainly, this job means I share posts on Facebook keeping my own friends up-to-date on things going on with convention, writing blog posts about convention on my personal blog, AND hosting my very own giveaway! This is one of my favorite parts because I have the opportunity to tell someone they get to attend this life-changing event for FREE! I get super excited about that because I know from personal experience how wonderful this weekend can be; and many people (but definitely not all) who enter the giveaway are potential new-goers. The Exhibit Hall on Saturday! So much to look at! This is actually a small crowd because many people were in workshops when I snapped this photo. On the first day I was able to attend a meet-and-greet for the bloggers and vendors at the convention. I got to talk to some wonderful people and hear the president of HEAV talk a little bit about the vision for this year’s convention, which was this: WHY each family chooses to homeschool. I love how the answer is personalized for each individual family. Because homeschooling is about what works best for each family, which is one of the many beautiful things about home education. It was asked that we not focus on the negative whys (like avoiding of public school) but the purely positive things; perhaps such things as a focus on family relationships, a study-at-your-own-pace approach, etc. I loved that she made sure to mention that the positive reasons for homeschooling should be the focus, not the negative. There is enough in the society we live in that reminds us all of the negativity surrounding us in this world – to have someone encourage us to be intentional about focusing solely on the good, the positive, the blessings, was a breath of fresh air! As someone who has grown up in the homeschooling community and who wishes to (Lord willing) raise her children someday in the same community and atmosphere, I love learning all I can about home education. I think it is definitely important to understand why you feel led to do something. Just like in many other areas of life, knowing your “why” is one of the most important steps in the journey as well as what keeps you going when hitting difficult times. Because of this, I thought the fact that they chose this to be the theme was beautiful and brilliant. If you were unable to attend the convention, I would still encourage you to think about why it is you feel the Lord leading you to homeschool. Discouragement will be prevalent in this journey and whenever it creeps up it will be so important to remember the answer to that question, “why am I doing this?”. It takes a great deal of trust, as well. Trust in the Lord with all of your heart. (Prov. 3:5) We must never forget these two things throughout any area of life and the path God leads us down. Homeschooling is just the same. I have been so blessed by this past weekend and hope that you will get the opportunity to attend next year! So, until June 8-10th, 2017… Have a blessed summer (and upcoming school year)! It’s hard for me to wrap my mind around… Forgiveness. I cannot comprehend it. To pardon someone’s offences toward you – intentional or not, the hurt I feel is real and it seems to be a part of me. How does one forgive? That seems like such a silly question to ask, even to me. It has paralyzed me at times because I just find myself stuck… dumfounded… not knowing how to do it. Yet, that’s exactly what Jesus did. And He did this so willingly and freely for ME! Salvation is personalized. Jesus died for Maiya’s sins. He forgave me for all wrongdoings against Him. Why? Because He loves me. I have the ultimate example of forgiveness and yet I still struggle. I think that’s where pride comes into play. I struggle even more so with pride. But Jesus loves the humble. He teaches meekness. I can never forgive if I do not swallow my own pride and forever and always remember that all that I do, I need to do because of Jesus Christ. Therefore, when I forgive, it does not need to be for any other reason than because I love my Savior, Jesus Christ. I don’t think that apart from Jesus true forgiveness is even possible. I don’t know how to do it. I think that’s because it is an act of love. Jesus loved me, so He forgave my sins even when I did not deserve it. In following, I need to forgive those who have hurt me simply because I love Jesus. Jesus commands that we love. Love who? All. Even those who have caused pain. I want to be careful to mention that I thoroughly believe that love does not mean trust and it does not mean we agree or support everything they do. To love others the way God intended means to understand that they are a human soul created in the image of God and as Believers we need to show kindness and compassion and through that, Christ. This commandment shows me that love is only possible through the blood of Jesus Christ. I cannot love everyone by my own will. It is physically impossible for me to do so. By nature I am too prideful to love those that oppose me. This can only mean one thing: I must strive with all my being to crave a passionate love for Jesus Christ and that through my love for Him He can love others through me. It is not by my will but by His alone. Because of forgiveness in Christ I no longer have to hurt. Because of love through Christ I will heal. It’s beautiful, really. Raw and even hard. But I find that the more I grow up, the more I see that it is the raw, difficult things that we have to battle for – I mean really BATTLE for – that are beautiful. God’s grace towards me leaves me speechless. I don’t understand why He takes such extreme measures to protect and love me, because I mess up so much. But then, that’s just part of who He is… He loves me more than I can comprehend. Because of Him I experience true healing through His love and I don’t have to hurt anymore. YOU don’t have to hurt anymore because of His love that pours out over us and wraps us in. Forgiveness can be one of the most difficult things to do, but with God all things are possible. Allow God to work in your heart so that you can forgive. Healing and growth are impossible otherwise. Because of where I work (at a school) and just my experiences outside of work around youth I am able to see how they act on a semi-daily basis. Something that I’ve noticed is the older you get the easier it is to spot those silly school girl/boy crushes. What I see in this age group just makes me want to cry out to them and tell them something that I wish so desperately more people would be making them aware of. I am going to specifically address girls because, well, that’s what I can relate to. Girls, any guy walking through the school hallway, no matter how good looking he may be, is so not ready for the responsibility of being the caretaker of your heart. He’s just not “into” you like that. He’s too young. I have seen many girls heartbroken because they thought that the boy they’re dating in high school or even middle school was the one. And I understand that marrying someone from high school is totally possible, but you’re definitely not going to be able to marry them while you’re in high school or middle school. I hope you’ll hear me out. That boy you think can make you happy needs to grow up first. I don’t say this in a harsh tone towards males. I think they’re fabulous. But I also happen to know that when boys are that young they have no idea what it takes to love you the way you ought to be loved; to take care of you the way you should be taken care of. To be honest, most of us girls, when we’re still that young, have no idea how to love them (men) the way they need to be loved either. So don’t think it’s all their fault and that you’re just waiting for them to grow up and mature. This is all a process that every single one of use goes through. If you’re open to it, the Lord will fulfill that desire for love and passion while you’re learning to grow in maturity and while you’re waiting for “him” to grow up too. Let boys be boys and mess around on football fields and play in the mud with their friends. Don’t give your precious heart to them just yet. Let them grow up first. If you wait for God to show you the man that will utterly desire you and cherish you the way you were meant to be cherished nothing would compare to it. I know that this world encourages, and even pushes, you to constantly be with someone or at least to be “in love” with someone. Don’t let that term become commonplace to you. Let it mean something special by giving your heart to Jesus and allowing His perfect timing and will guide your love story. Don’t let the petty “dating game” keep you from the potential God has in store for you when you let Him be the Lover of your soul. It’s hard. I’m not saying otherwise. Nothing worthwhile is ever easy. But with time and grace it becomes more peaceful and meaningful. Be in love with God and let Him show you your Prince Charming when the perfect time comes. It’s worth the wait. I am so excited to be the very last blogger giving away a FULL pass for this year’s HEAV Homeschool Convention! Leading up to this giveaway I have talking about some things to remember while preparing for/attending convention that you can read here, and some things that I have learned I definitely want to have on hand while at the convention that you can read about here. I also wanted to take this opportunity to share a few blog posts that I have written in the past specifically for HEAV’s convention. In ‘Get Excited about 2015 HEAV Convention! Volunteering’ I had the privilege of interviewing three lovely ladies that range in their experience as convention volunteers and LOVED reading through their different replies. I hope you will take a minute to read it and get excited to volunteer this year. ‘Four Things I Learned at the Homeschool Convention’ is actually a link up to HEAV’s blog. It’s something that I wrote after attending the convention and goes through a few things that I gleaned from my time spent at the convention that weekend. In ‘HEAV Homeschool Convention… It’s for Teens and Young Adults, too!’ I talk about how there is something for everyone there, including those of you who fall under my age-group: young adults. Go there being excited and ready to learn (yes, learn) and trust me, you will have a wonderful time. I pray that this will be a blessing to just the right family! I have full confidence that the Lord knows who will benefit from this and I want to tell you in advance: congratulations! I am so excited for you to be able to attend this year. So enter! My name is Maiya. I live, love, and serve at home because I believe that is where God has called me during this season in life. I am extremely passionate about serving those around me, starting with my family: two wonderful parents and eight siblings. Also, serving my community to spread God's light and love in this world. I currently teach beginner piano, volunteer at my local Crisis Pregnancy Center (because life is so important to me), and take hold of opportunities to host Bible studies, book clubs and help my mom with homeschool co-ops. Words are important to me - and the One who rescued me from my sins and calls me His daughter is the most important: Jesus Christ my Lord and Savior - so starting a blog came to my attention as a way to share my journey with my Heavenly Father... I hope you'll join me! 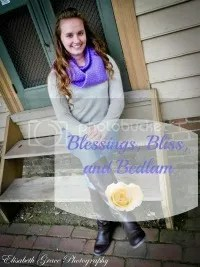 Blessings, Bliss, and Bedlam on Facebook!